This article was originally published at Survival Punk and is reprinted with permission from the author. We appreciate it James! Stoves and cooking are two things I love. Maybe I’m just a pyromaniac foodie at heart. 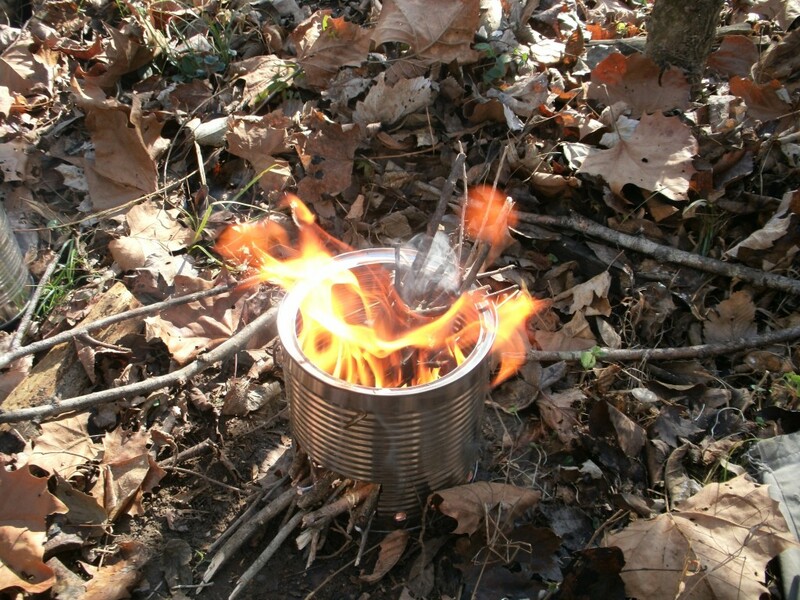 After several alcohol stoves, esbit stoves and my Jetboil with modifications, I decided it was time to make a wood burning hobo stove. 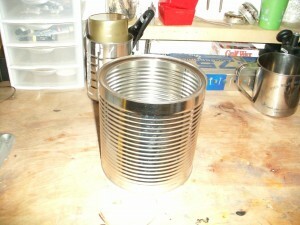 I had a empty coffee can saved up just for this project and decided it was finally time. Enough jiba jabba lets get to building! 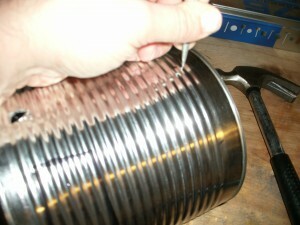 The first thing you will need to do this project is an empty coffee can. Use the big metal ones. I bought it in this container for this project. Drink all the coffee in it. Hopefully spread out over a few weeks. 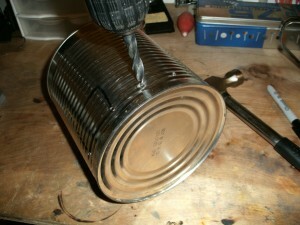 Next I used a sharpie to mark around the can where I wanted to drill the holes. 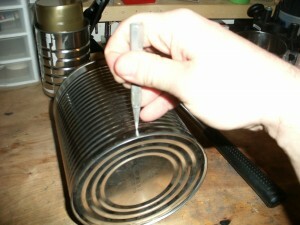 I put the point of the marker inside one of the can ridges and turned the can. After marking it I used a center punch to make starting duvets so my drill bit wouldn’t skate around on the metal. I used my Dremel drill press to make the starter holes. You can do it without one but it sure makes it easy. 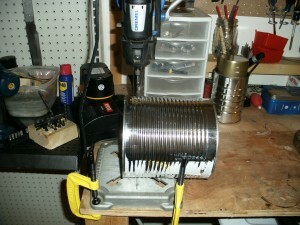 A full sized drill press would be even better, just not apartment friendly. My workshop is in my living room after all. Life of a bachelor. Once I had my piliot holes I used my cordless drill and the 1/2 inch drill bit to make the holes the size I wanted. Next I marked four more spots, this time on the top of the can, where I will run my pot holders through. After marking them I drilled them out on the Dremel. These holes will remain small. I cut two coat hangers to make my pot holders. I put the in and tested the fit with a pot on them. 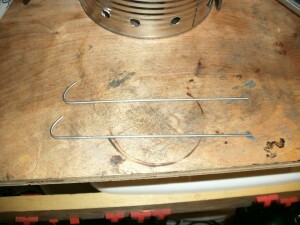 They hold great and fit perfectly inside the holes drilled. I marked a spot on the can to cut out for an opening to feed wood into. The dremel made easy work of this task. 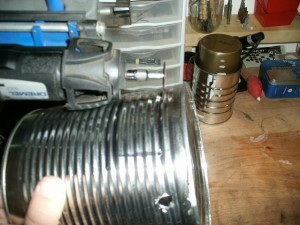 Pingback: 33 Awesome DiY Projects for Preppers | Alternative News Alert! Sorry it’s hard to see how the pot holders fit into it. Can you provide a shot with no fire? Hi Rob. Just forwarded your message to the author (James) over at Survival Punk. I’ll forward it to you when I hear back from him. Or you could go to his site and check with the source. He’s a great guy. Here ya go, Rob. James cranked this one out just for you, brother. I just did this with my daughter and she cooked lunch on it. Great design and great idea.